No charge to participate. No experience necessary. Aprons will be provided, but wear clothing appropriate for painting. Gallery 25 at New Milford Art Depot is a co-op style gallery exhibiting some of the best local fine art and artisan creations. The gallery is staffed by member artists and is affiliated with the New Milford Commission on the Arts. This spacious center of creativity is located at the historic Railroad Station, 11 Railroad St. New Milford CT. Hours are Thursday, Friday, Saturday, and Sunday, noon to 5 PM* and by appointment. (*please note Friday and Saturday noon �" 8PM holiday hours through Dec. 31). Admission is free. Ample parking is available. For more information please call 860-355-6009. 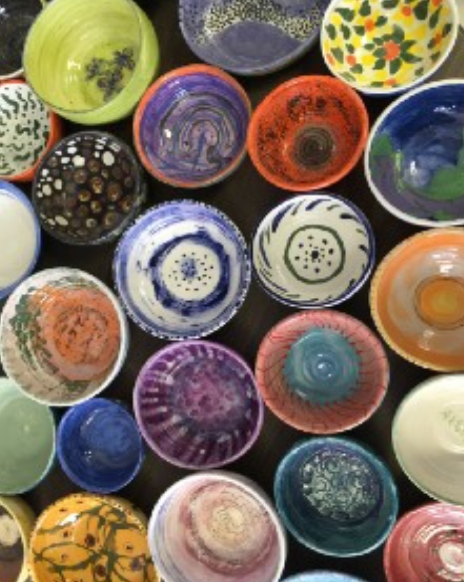 The Empty Bowls dinner will be held at St. John’s Church in New Milford on April 6, 2019 and will raise money for Loaves & Fishes. Tickets on sale in March.